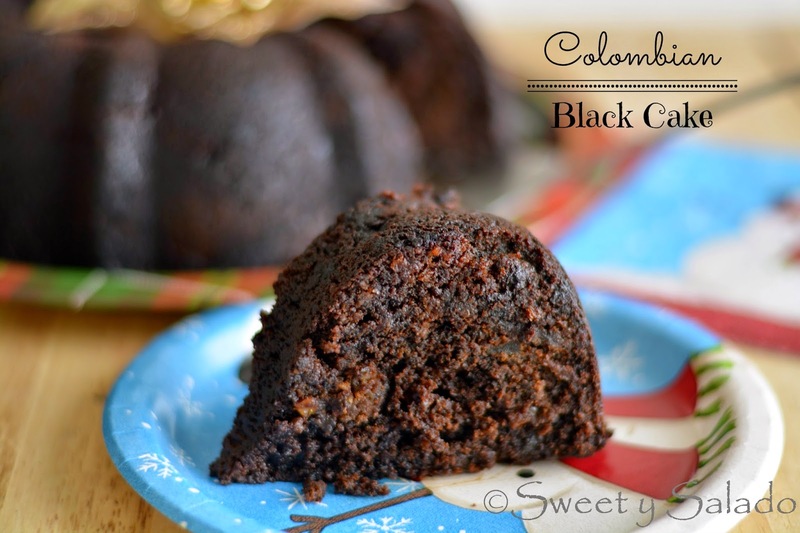 Every time I post a cake recipe on the blog I get several requests for Colombia’s most famous cake, which we call different names like “black cake”, “wine cake”, “wedding cake”, among others. It is so popular that it’s the one cake that is served for many special events like baptisms, first communions, weddings and holidays, like Christmas. And if you feel that you may have seen a similar version before, you’re not mistaken, because other countries, like Jamaica and Venezuela, also have their own black cake versions. And if you have followed my blog for a while you will know that I’m all about making things easier, so for this recipe I do not soak my dry fruit in wine for weeks in advance the way some other people do. I find that it’s not necessary at all and that the liquid it retains makes it kind of sink to the bottom. Another tip is to use only burnt sugar or caramel color so you can get that very dark, almost black color. 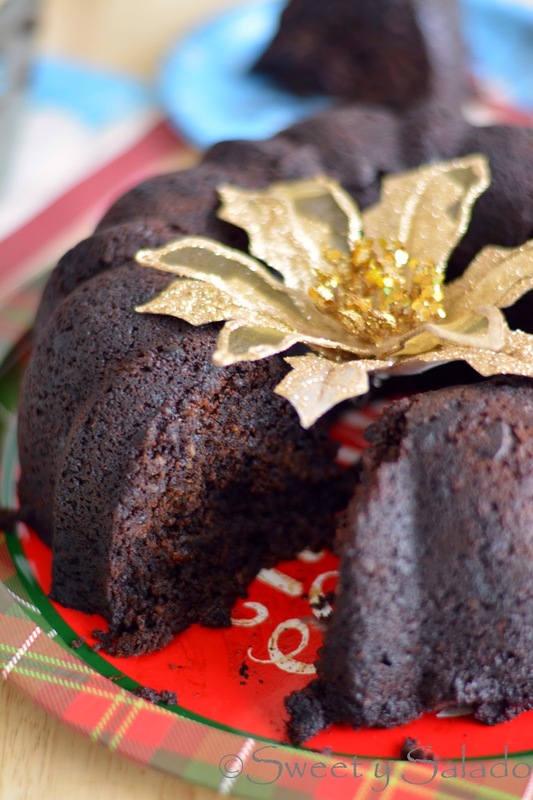 I have seen recipes that call for molasses or dark chocolate but they only give the cake a dark brown color, which is not typical for this recipe. And one last thing, try to get a good quality sweet red wine, and no, it doesn’t have to be expensive because you’re just using it for a recipe, but then again, you don’t want to ruin your cake with some cheap wine you found on sale. My favorite wine to use is ruby Port, which has a sweet, red berry taste that goes really great with this dark, decadent cake. In a food processor chop the raisins, prunes, almonds and pecans into small pieces or the size that you prefer. Then, chop the figs with a small knife and mix them in with the rest of the dry fruit. Set aside. Mix the chopped dry fruit with the cake batter using your hands and make sure the dry fruit is well distributed. Pour batter into a prepared bundt cake pan and cover with aluminum foil. Bake for 1¼ - 1¾ hour or until a toothpick inserted in the middle comes out clean. If you're using a round 8-9 inch (20-23 cm) cake pan, the baking time may be less. Remove the aluminum foil after 1 hour of baking. Once the cake is ready, let it rest inside the pan for about 10 minutes. In the meantime, mix the rum and the wine in a separate container. Then, remove the cake from the baking pan and place it on a sheet of aluminum foil. Pour the wine slowly all over the cake, cover with plastic wrap and then tuck in the aluminum foil so the cake doesn't dry out. Let the cake sit in a cool place at room temperature for at least 3-5 days before serving. Don't let the cake rest in the refrigerator because the cold will dry it out. Gracias Diana!! Lo voy a intentar para el cumpleños de mi papi. Es su favorito! Que "frosting" podria usar? En Colombia cuando la hacen para bodas la cubren con fondat, pero una crema sencilla de mantequilla (buttercream) también te sirve. Me salio estupendo! Decidi solo ponerle miel y coco rallado! Este año se lo voy hacer para la fiest de mi mami, ahora si tratare el buttercream, cual receta me recomiendas? ¡Qué buena noticia! Y muchas gracias por hacer la receta. =) Si quieres puedes tratar con crema de mantequilla (buttercream) con sabor a vainilla que es la que más se usa para decorar tortas. La receta la tengo en la sección de Dulces del recetario. That's wonderful, Cathy! What video did you watch to make it? I have tried to make it several times but either the sugar crystallizes or it doesn't get dark enough. Diana, try “cook like a Jamaican” for how to make burnt sugar as I think she has instructions there. Since you are an accomplished cook I don’t think that you will have a problem if you follow the directions exactly. I make a large amount and save it because it makes a bit of a mess so I clean up just once. Diana!! cuantas recetas tengo q hacer para un molde de 9X13? Con estas medidas puedes usar un molde de 8×12, que tiene capacidad para 6 tazas de mezcla. Un molde de 9×13 tiene capacidad hasta para 14 tazas, o sea que pudes duplicar la cantidad para usar ese molde. Para serte sincera he tratado de hacer el quemado de panela con panela y no me queda lo suficientemente oscuro, la torta me queda café oscura, pero no negra. Con la melaza he tenido el mismo resultado, solo le da un color café a la torta, pero no, no tienes que cambiar la cantidad de azúcar en la receta para hacerla. Hola. He hecho mil veces tu receta de tres leches y siempre es un exito. Hoy estoy ensayando esta receta. Una pregunta esta torta se puede hacer con un vino semidulce?? Hola Diana, tengo un recipiente rectangular para una libra. Tengo que duplicar todos los ingredientes??? Hola, esta receta la he hecho en un molde de 8 x 2 pulgadas (20 x 5 cm) que tiene capacidad para ½ libra. Así que si tu molde rectangular mide 13 x 9 pulgadas (33 x 23 cm), sí te debe servir para hacer una torta de 1 libra y duplicar la cantidad de ingredientes. Hola Diana, una pregunta, para un cake de 10inches cómo serían los ingredientes porfa!!!!! Ya he probado hacer la torta y queda muy rica. La voy a hacer para mi matrimonio ! ¡Hola! Necesitas dividir el área del molde de 10 pulgadas por el área del molde de 8 pulgadas. La diferencia es de 1.58, o sea que puedes multiplicar los ingredientes por 1.5.